The Cabbage Soup is an all-you-can-eat-cabbage-soup diet which claims that the more cabbage soup you eat, the more weight you'll lose. The diet's so-called fat burning soup contains negligible calories so you don't have to worry about gaining weight. The Cabbage Soup Diet states that by adhering to the Cabbage Soup Diet for 7 days will result in immediate weight loss. On the Cabbage Soup Diet, individuals are encouraged to eat as much Cabbage soup and consume as much water as they want. Other foods are involved as well but their intake is severely restricted. The cabbage soup can be eaten as many times but it is not recommended that you eat soup only as it can result in malnourishment. The obvious criticism of the Cabbage Soup Diet is that it is not a nutritionally sound plan nor does it make any claims to permanent weight loss. 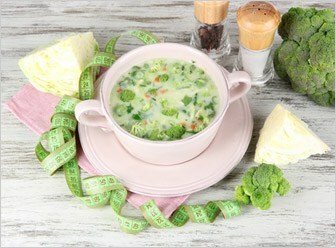 The general consensus is that the Cabbage Soup Diet is effective in temporary and quick weight loss but is not effective for long-term weight loss. The actual cabbage soup does not contain any magical weight loss ingredient, although it is almost calorie free.